This article is based on online coverage of Apple's product announcement. A lot of details are sketchy at present, and Apple has released almost nothing in the way of tech specs. We will post a full profile when Apple makes data available. It's called the iPad, Apple's new handheld computer that's designed to create an entirely new category of devices between the iPhone/iPod touch/smartphone and the notebook computer. Since it introduced the iPod in 2001, Apple has sold 250 million units. Its iPhone redefined the smartphone market and now had 140,000 apps available. Over 3 billion apps have been downloaded for it. Apple redefined notebook computers with the PowerBook in 1991, and today notebooks dominate the Macintosh market while PC vendors fight each other over low cost, low profit, low power netbooks. 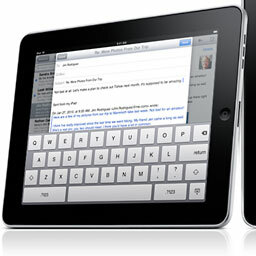 The iPad works like an oversized iPod touch, but new and updated apps have been modified for its larger 9.7" display. For instance, when you to go email, the onscreen keyboard automatically appears - and it's large enough to type on. The screen is large enough that you can view a monthly calendar meaningfully - the text isn't so small that you can't read it without zooming. Of course, iTunes is built in, and there's support for HD YouTube videos. Specifications: 0.5" thick, 1.5 lb., 9.7" display with full capacitive multitouch support. It's powered by Apple's own 1 GHz A4 CPU - processor, graphics, I/O, and memory controller on one chip - and includes 16 GB to 64 GB of flash memory. 802.11n WiFi is included, some models have 3G wireless, and battery life is rated at 10 hours - or a month in standby mode. It's got the same dock connector as the iPod and iPhone. The iPad is very green - no arsenic, BFR, mercury, or PVC - and it's highly recyclable. It can run iPhone apps out of the box, either at native size in the center of the iPad's display or scaled up (doubled). The 9.7" LED backlit screen has a 1024 x 768 resolution. An iPad Software Development Kit is available today, and some games have already been updated for the new display and processing power. The New York Times has written an app especially for the iPad and shows that at least one print media organization really gets it as far as the Internet goes. 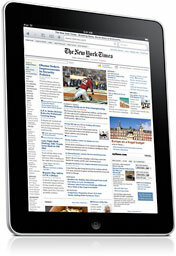 The iPad app shows newspaper-like pages, allows the user to set the number of columns, and shows videos. Bravo! After showing off a couple games, Jobs introduced iBooks, Apple's ebook reader that uses the ePub format. iBooks can be purchased through the iBookstore (which uses the same accounts as the iTunes Store and App Store). You can change the typeface and size, and Apple promises that textbooks will be available - college students rejoice! Next, there's iWork for the iPad, which has a whole new user interface. It includes Keynote, Pages, and Numbers, just like the Mac version. Price is $9.99, probably per app, not for the iWork suite. 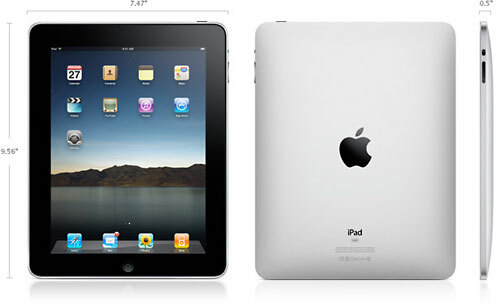 There will be different versions of the iPad, including some with 3G wireless. AT&T has a $30/month unlimited data plan, or $15 for 250 MB of data. Both plans include free use of AT&T WiFi hotspots. Best of all, these plans are prepay with no contracts! 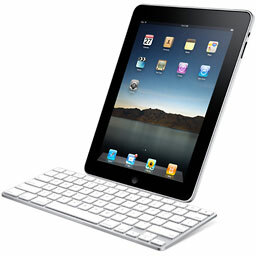 Unlike the iPhone, the iPad is unlocked and uses new GSM micro SIMs. Apple hopes to have worldwide data support available in June or July. Apple is offering a $499 iPad! Wow! Prices: 16 GB, no 3G, $499; 32 GB, $599; 64 GB, $699. 16 GB with 3G, $629; 32 GB, $729; 64 GB, $829. The WiFi models will ship within 60 days, and within 90 days for 3G models with worldwide availability. Apple has a dock to hold the iPad upright when charging or docked to your computer. Put your iPad in the dock, and it acts as a digital picture frame. For serious keyboarders, Apple has a full size mechanical keyboard that uses a dock and supports the iPad in vertical/portrait mode. There's also a case that can be used as an easel to display the iPad in horizontal mode. If you already have an iPhone or iPod touch, you can use your existing apps with the iPad - no need to buy them again. Like the iPhone and iPod touch, no multitasking. There does not appear to be a built-in camera, so no video chat without accessories.